While in Tokyo, use the services of a professional local guide to customize your own sightseeing itinerary. Once you select a half-day or full-day tour to suit your schedule, you decide the pace of your day and how much you’d like to fit in. Explore at a leisurely pace on a guided walking tour, using the city’s efficient public transportation system to get you around. Or upgrade for a private vehicle to pick you up at your hotel. Then visit your choice of historic, cultural and culinary attractions in the vibrant capital. After you’ve seen the sights, your guide offers convenient drop-off at your hotel. Half-day custom tour on foot or by private vehicle If you’ve selected a half-day tour upon booking, your guide can arrange a visit to several Tokyo attractions or city neighborhoods. Four hours allows plenty of time to learn how to pay a proper visit to Meiji Shrine, then try a few snacks or even go sake tasting if you wish (own expense). You might enjoy the amazing architecture and trendy shops of Harajuku, Omotesando and Shibuya neighborhoods, or head to Akihabara for electronics, video games and Japanese manga. Full-day custom tour on foot or by private vehicle Eight hours of sightseeing allows you to take in even more of the city. Start with a visit to Tsukiji, the world’s largest wholesale fish and seafood market. Or perhaps head to downtown Tokyo and its fantastic museums, enjoying a bit of the old Tokyo that remains in the street food and traditional shops. 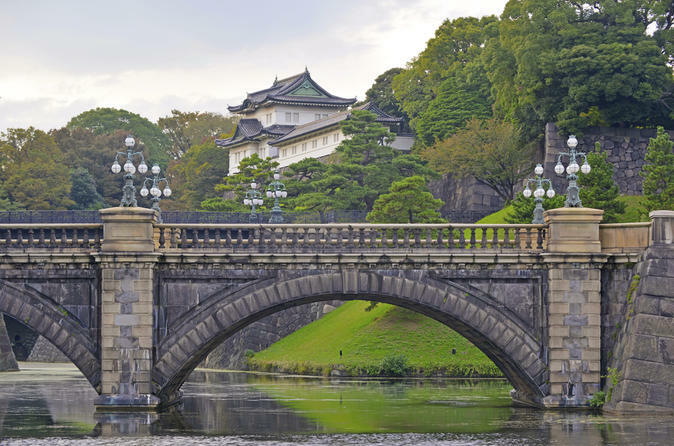 How about touring the Imperial Palace or Hamarikyu Garden, where you can appreciate the magnificent view while enjoying traditional sweets and green tea? See Koishikawa Korakuen Gardens, especially beautiful in the autumn, or Shinjuku Gyoen National Garden, a mix of traditional Japanese and Western design. During a restaurant lunch, get to know the many ingredients common to Japanese cuisine. At a sake brewery, learn how sake is made and try a few varieties (own expense). No matter what your interests are, there’s always a great neighborhood to explore in Tokyo. Consider the upscale Ginza, a famous shopping district where fashion brands as well as shops selling Japanese swords, bonsai, kimonos and green tea can be found. Get a sense of Tokyo during the Edo period in Asakusa, or head to Shinjuku’s bright lights and hidden alleys, full of tiny bars with big personalities. If you’d like, you can watch aikido or even take a lesson, or try your hand at a calligraphy class (own expense) — your wishes are the limit! Special Offer - Travel by February 28, 2018 to save 20% off our previously offered price! (This special offer is available only on Full-day Tour+Public Transfer and Half-Day Tour+Public Transfer options.) - Book Now!